Sweets for your little companion and sachets of herb for your cat. We offer 100% corn treats to reward your rabbit, hamster, rat and other rodent. They love it ! 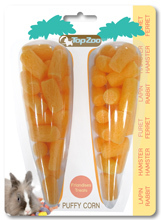 These treats allow your rodent to have fun without spoiling his diet. Catnip is an aromatic plant that belongs to the mint family. It is called "cat grass" because of the attractive and hallucinatory effect it has on cats. It contains an active ingredient that acts on the nervous system in cats. One can compare the effect to that exerted by the sexual pheromones released during the nuptial parade. Cats do not eat it, but inhale it. The behavior of cats may suddenly seem "crazy." They can rub themselves, roll on the ground, jump, run, salivate, adopt hunting behavior ... All cats are not sensitive to the effects of catnip.